This is the story of the only family rehab in the UK, where children live with addicted parents as they recover. They have 6 months to get clean, or they will lose their children for good. This rehab believes these parents deserve a second chance with 79% of families completing the programme. Produced in partnership with The Open University, Episode One follows events as St Mary’s Hospital in Paddington receives victims from the Westminster terror attack. 12th May, Florence Nightingale’s birthday is Nurses’ Day. 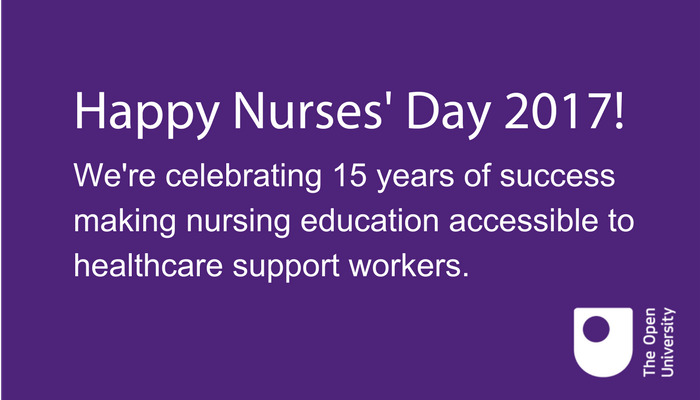 Colleagues in WELS’ Nursing Team are celebrating 15 years’ success making nurse education accessible to healthcare support workers. A new 2-part OU/BBC series was shown on 3rd and 4th April. The series was commissioned for the University by OMIL, working with WELS Nominated Academics Tyrrell Golding, Dr Naomi Holford and Andy Rixon, and Media Fellow Fernando Rosell-Aquilar. In the year 2000 the BBC began filming the lives of 25 children born across the UK. As they turn 16, Professor Robert Winston and Professor Tanya Byron discover how they are being affected by huge changes in their brains and behaviour that could shape their lives forever. 11 January-15 February. Filmed over six weeks, Hospital is the story of the NHS in unprecedented times. Edited and broadcast within weeks of filming, this timely six part series for BBC2 captures the day-to-day realities facing the NHS right now. The Open University sees success as one of the collaborating research organisations in an ESRC-funded Grand Union Doctoral Training Partnership (DTP). The School of Health, Wellbeing and Social Care's massive online open course (MOOC) 'The Lottery of Birth' will examine the inequalities of birth, with a particular focus on being rich or poor and being born male or female. We are delighted to announce that our BBC co-production ‘Simon’s Choice: How to Die’ won Best Documentary on a Contemporary Theme (Domestic) at the 2016 Grierson Awards.